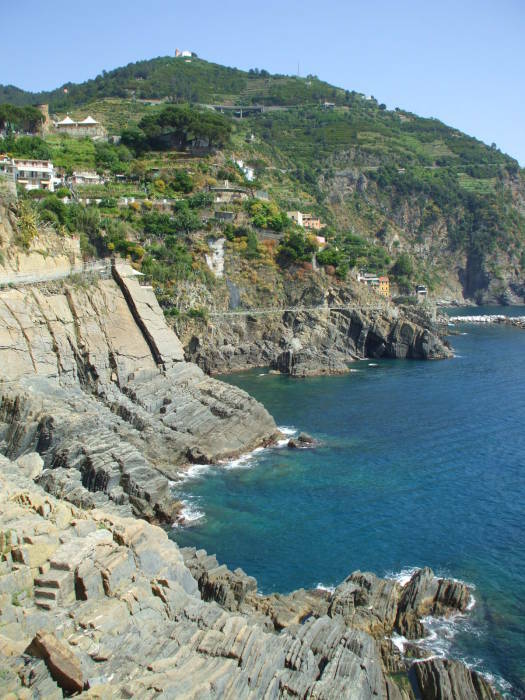 Cinque Terre, or, in English, the Five Lands, is a beautiful chain of five villages along the Ligurian Sea coast mid-way between Pisa and Genova, just north-west of La Spezia. 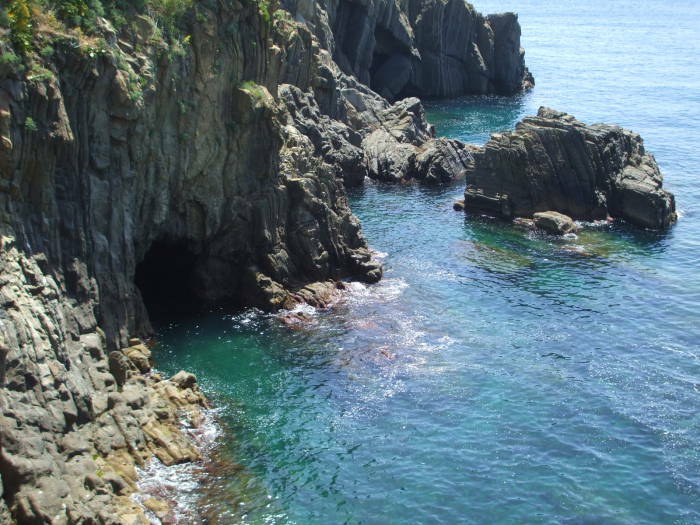 A UNESCO World Heritage Site comprises the coastline area including the five villages and inland through the surrounding hills. The area is close to Pisa. 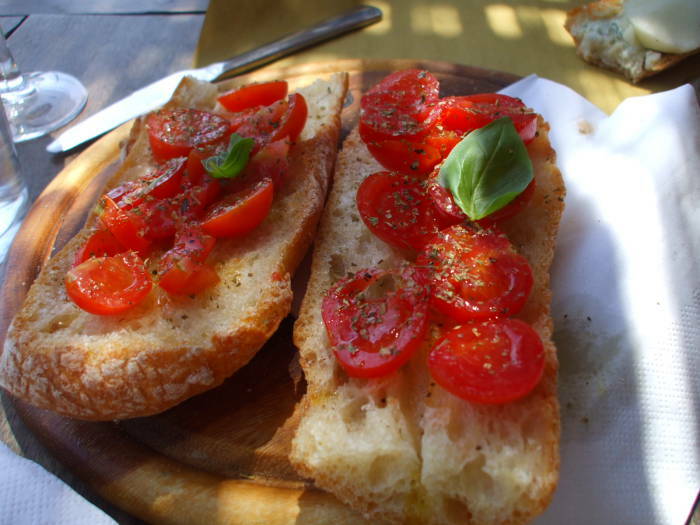 It can be visited on a day trip out of Florence thanks to Italy's frequent fast trains. The detailed map below shows how the rail line from La Spezia runs almost entirely through tunnels along that section of the coast. The train only emerges briefly from a tunnel as you pass through each village. 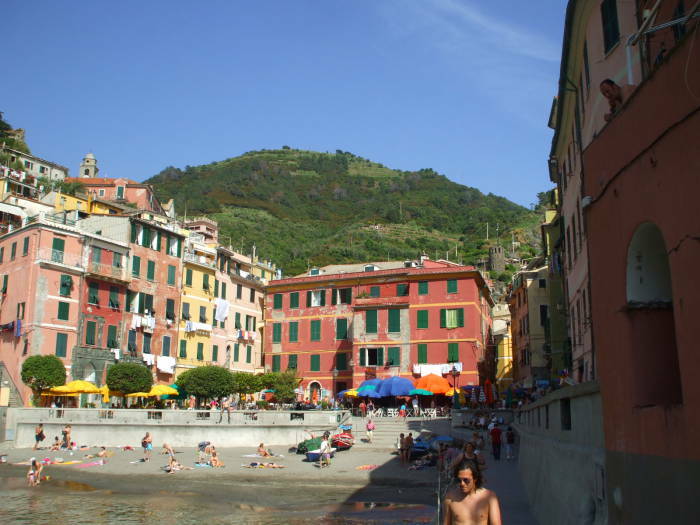 General location of Cinque Terre. 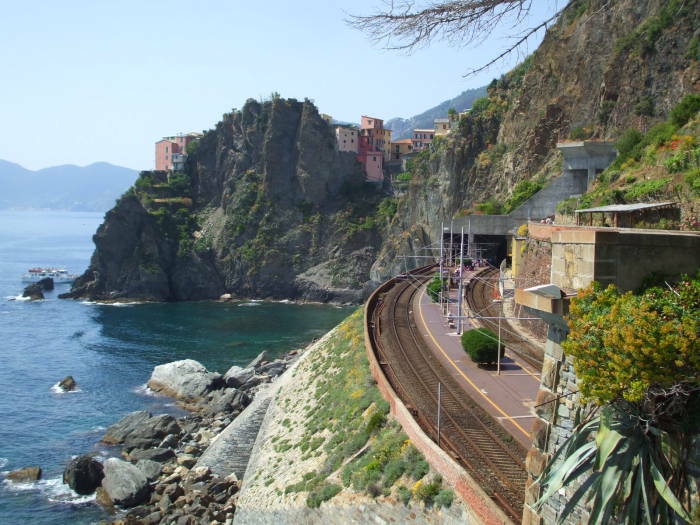 Start by taking the train to La Spezia. 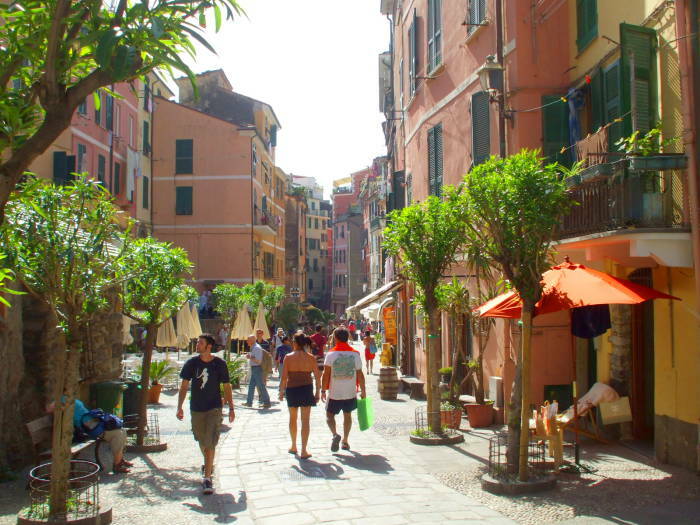 Once you're there, buy a Cinque Terre pass good for unlimited travel. 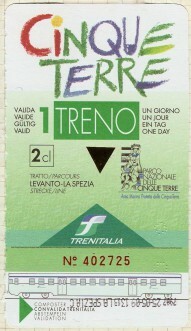 As with all Italian train tickets, you must validate the ticket before use. Just stick it into the ticket validating machines you find on the platform. See the date and time stamp newly printed upside down across the bottom of this ticket. 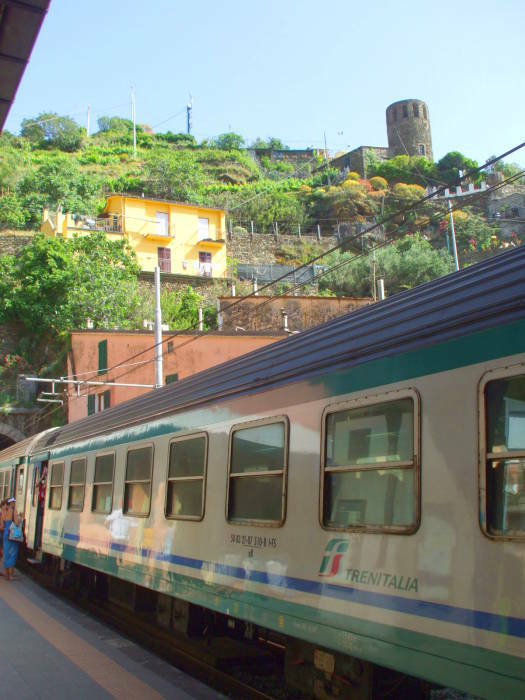 The ticket is good for unlimited train travel on that day, as well as unlimited access to the foot path running the length of the Cinque Terre. You need a ticket for a foot path? Yes, access is controlled, and part of the (low) cost of the ticket goes to maintaining the foot path and the rest of the coastline. You need the ticket anyway, to get to any of the villages. 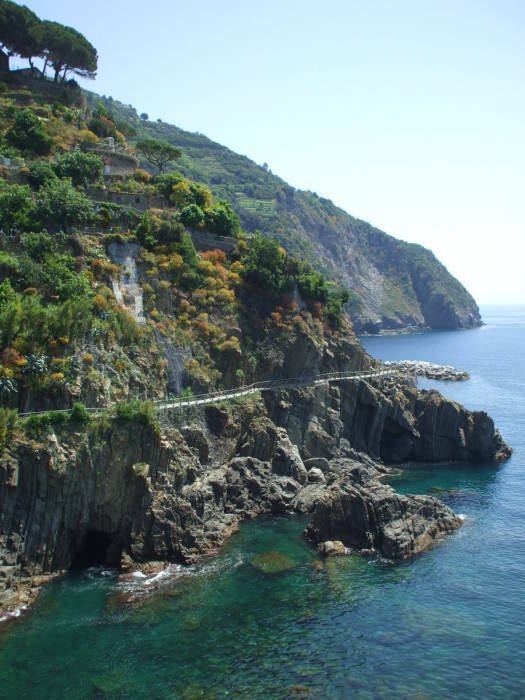 There is very limited road access to the entire Cinque Terre, access is mostly by train and boat. Trains run in each direction about every 30 minutes. 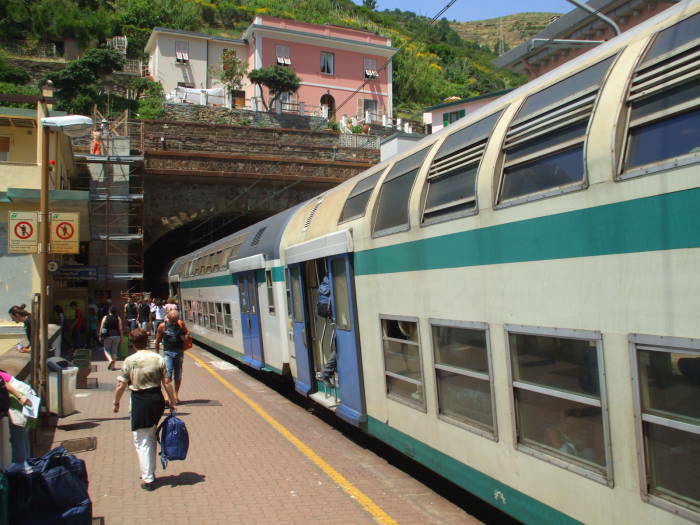 Pick up a schedule when you buy your ticket if you are concerned about getting back to La Spezia in time to make an onward connection. 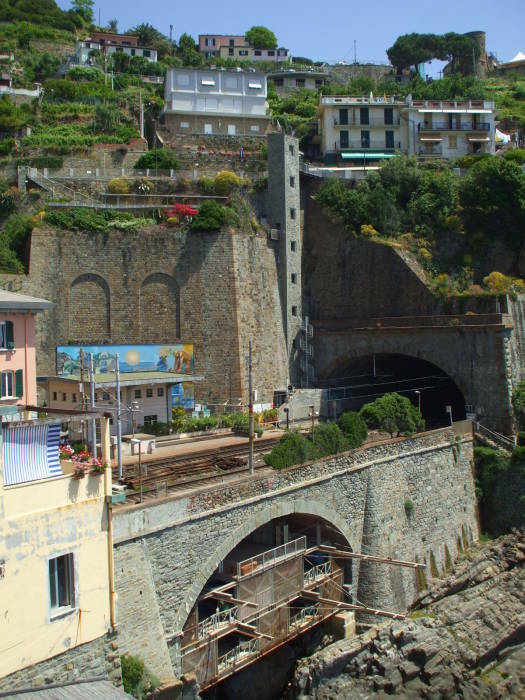 The trains pass through a series of tunnels, and are below ground for most of their passage through the Cinque Terre. 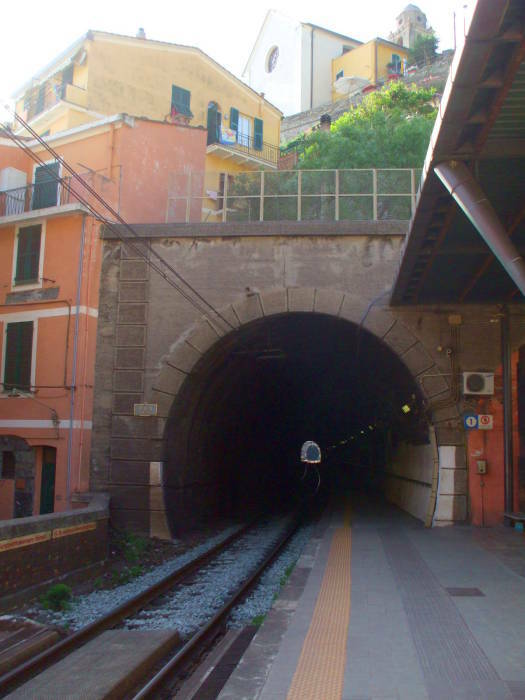 The five village stations are in short exposed sections of track usually no longer than the short local trains, and in some, like Vernazza, you may be getting on or off the train on the section of the platform that extends into the tunnel. 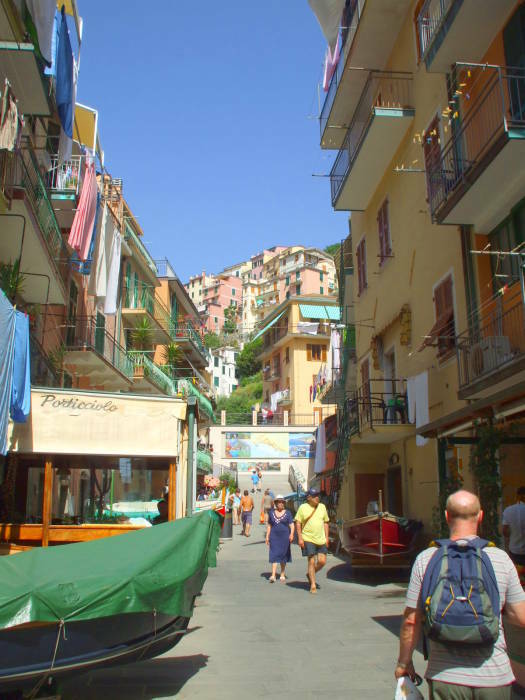 Riomaggiore is the first village you reach out of La Spezia. With a population of 1,823, it is the main village of the five. There is a small settlement immediately around the station, seen below. Immediately outside the station, a set of stairs leads up and then over the rail line. Just above there is a great cafe/bar, A Píe de Má. Here is the view back down to the station from the shaded terrace at A Píe de Má. 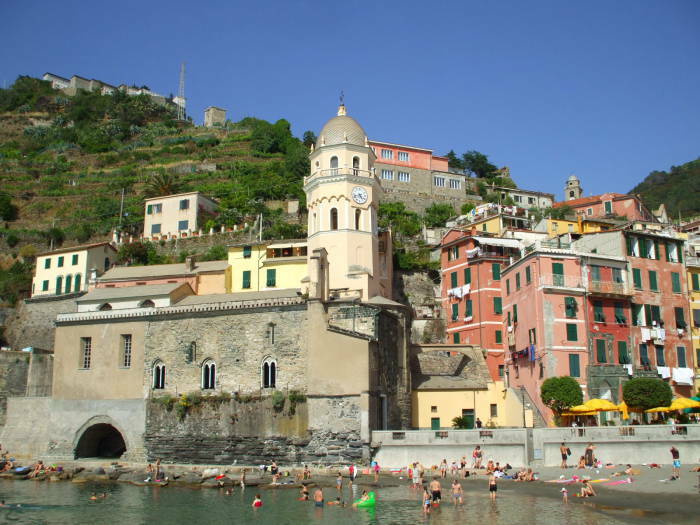 The village of Riomaggiore, with its tiny port, dates from the early 1200s. There is a diving center where you can rent snorkels and kayaks. 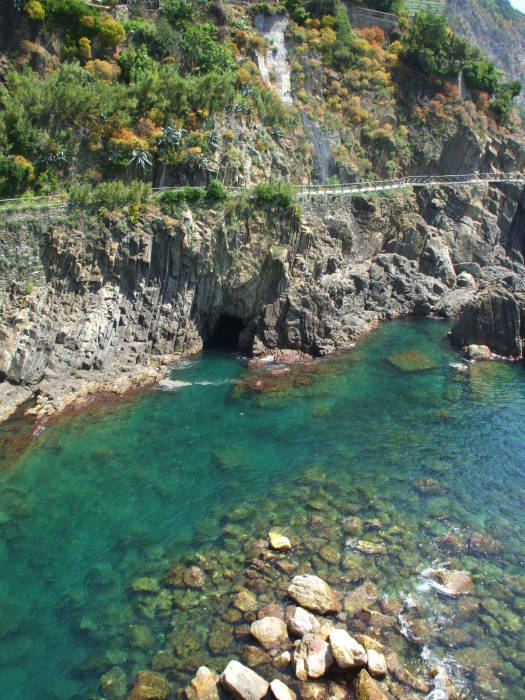 To get to the main part of the village, you could walk through a pedestrian tunnel, or follow the coastal path, seen below. 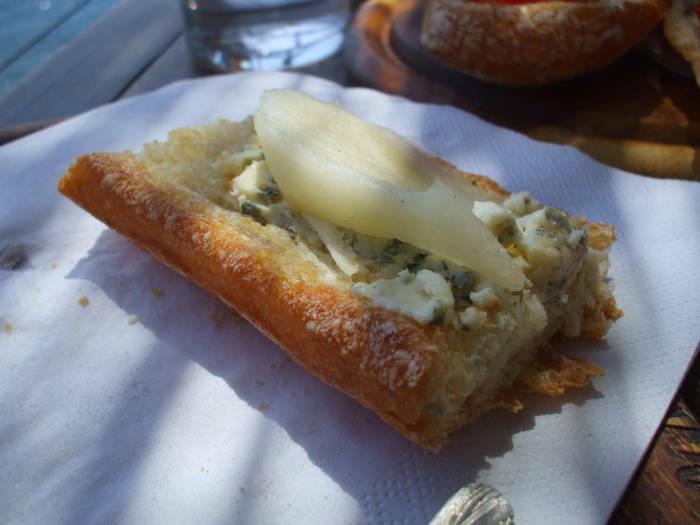 Or, you could what we did — relax for a long time at A Píe de Má! 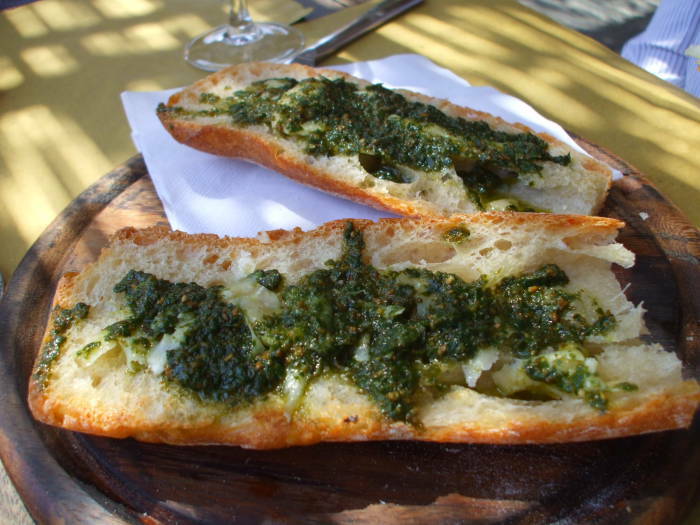 The bruschetta is very good, and comes in several varieties. 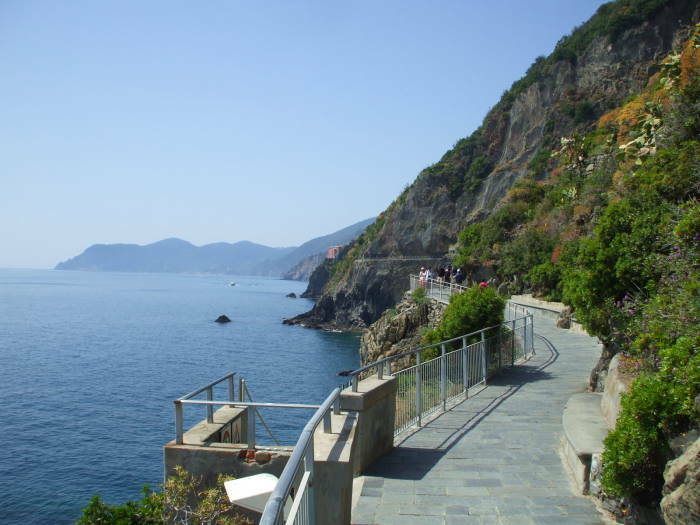 La Via dell'Amore, or Lovers' Lane, is the coastal path joining the Cinque Terre villages. 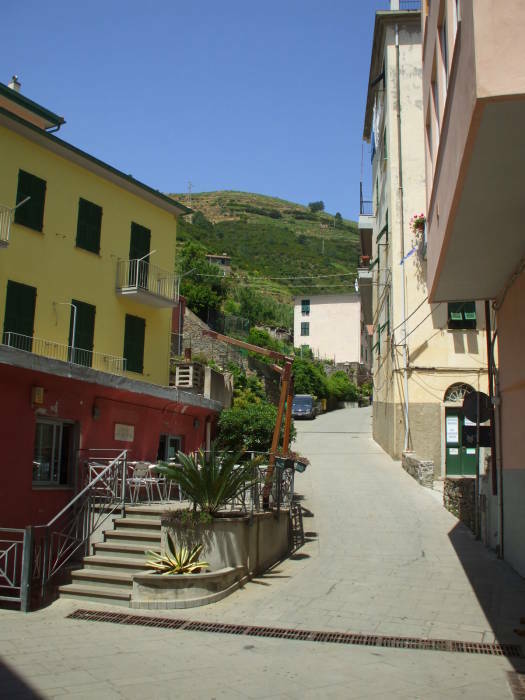 Show your ticket at the hut just above A Píe de Má and start walking to Manarola, the next village. This is the easiest section of the trail. 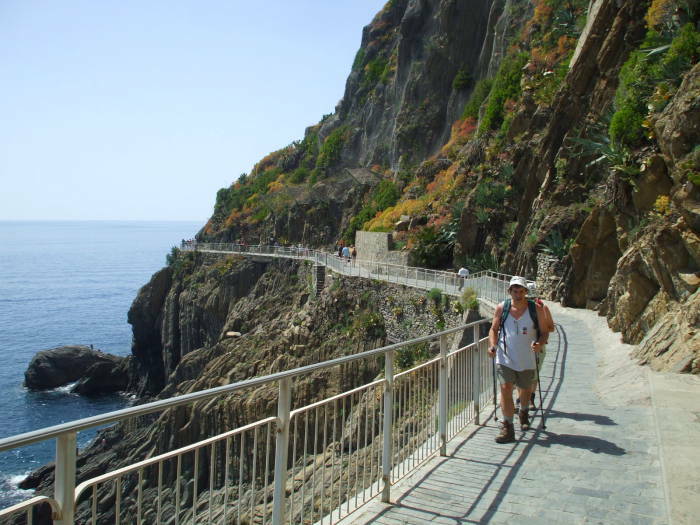 The approach to Corniglia from Manarola finishes with a staircase of 368 steps. 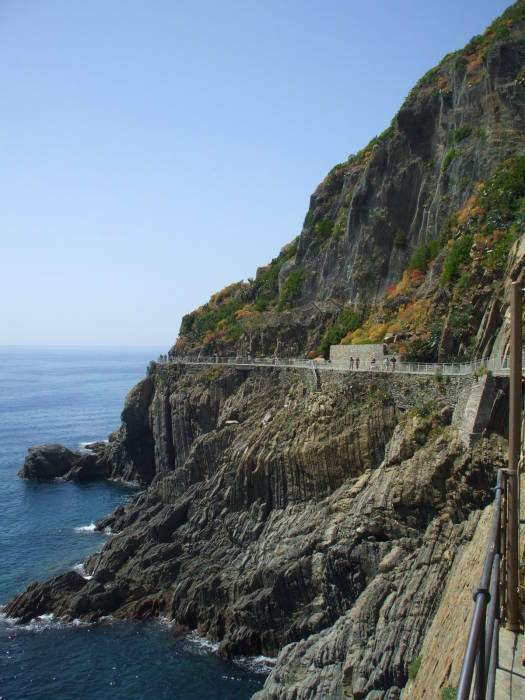 The trail from Corniglia to Vernazza is steep in places, and from Vernazza to Monterosso is far steeper. 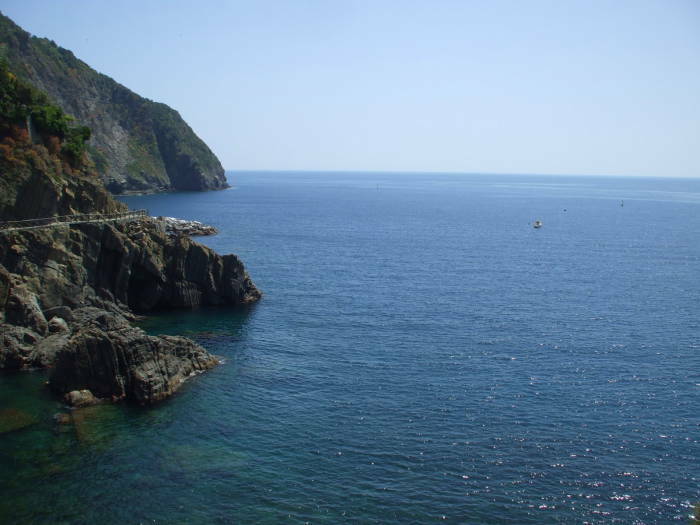 The entire Cinque Terre region is in the Parco Nazionale delle Cinque Terre, created to conserve the environmental balance and protect the landscape, and to preserve the traditional settings of the villages. 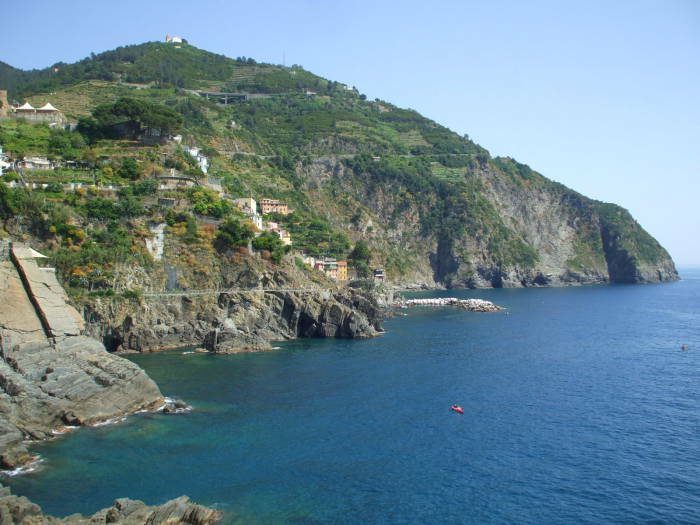 The coastal hills of the Cinque Terre area have been farmed for centuries. There are olive groves down low, and vineyards higher up. The centuries of agriculture have led to elaborate terrace systems. Tourism has taken the place of fishing and viniculture in the local economy, and the amount of cultivated land has dropped from 1400 to just 100 hectares. There is now concern that the if the terraced hillsides are not worked, erosion and major landslides will follow. 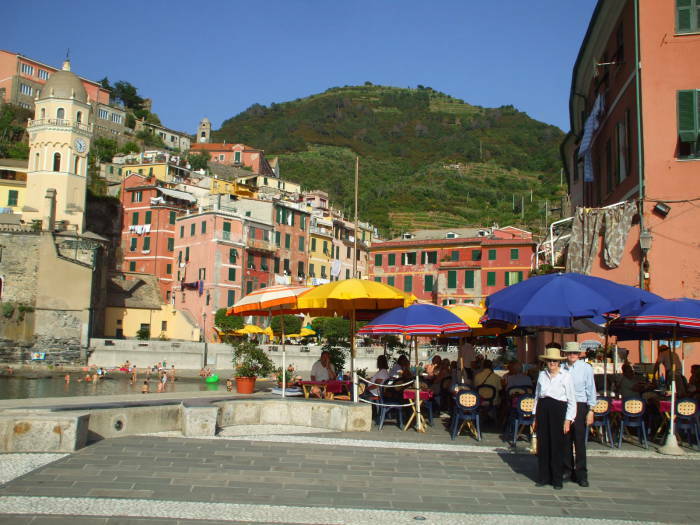 The local wines are the Cinque Terre (of course!) and the Sciacchetrà. 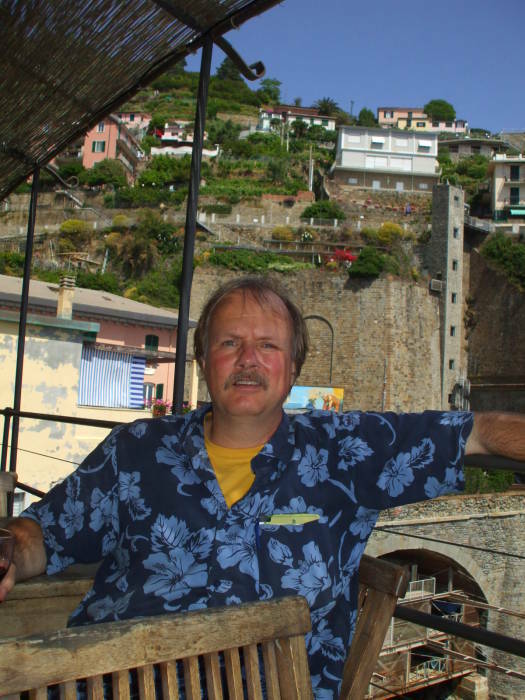 Writings from back in Roman times spoke highly of the local wines in this area. 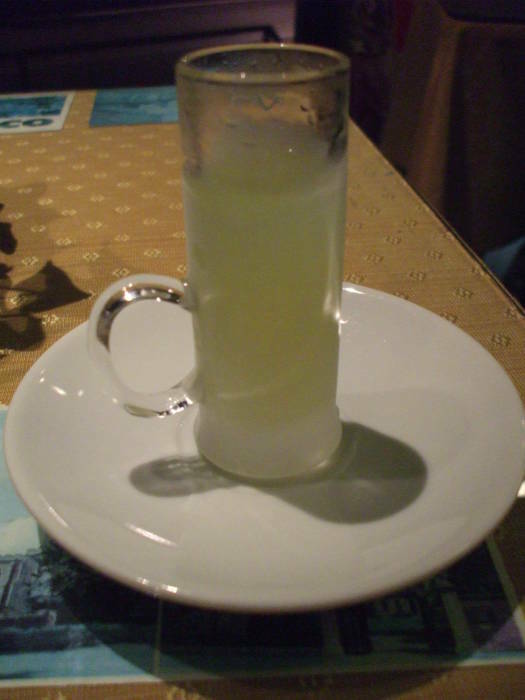 Of course, limoncello is also popular here. This section of path is smooth and mostly level, like a sidewalk. It passes through some overhangs and a short tunnel section with plenty of windows for natural light. 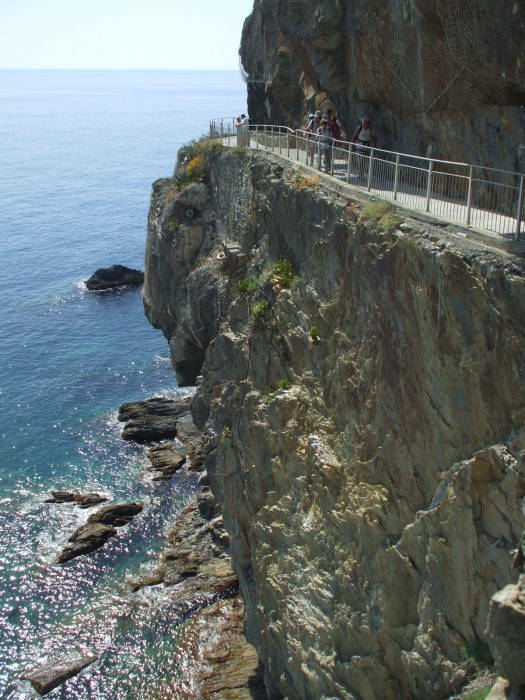 The overhangs and tunnels are for protection in areas susceptible to rockslides. 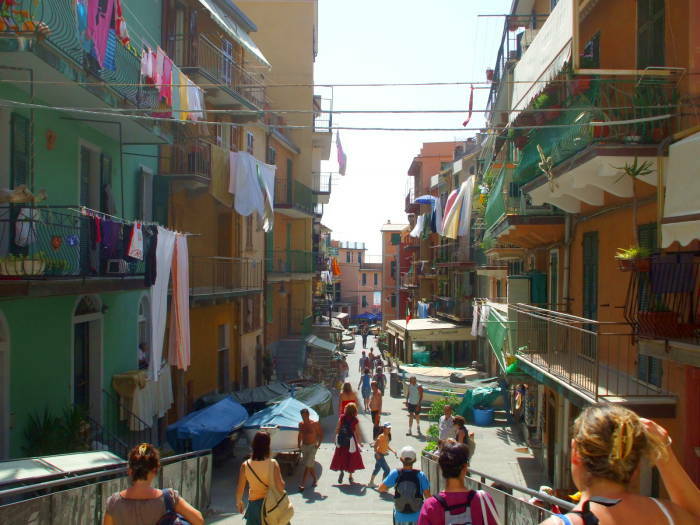 Manarola, the next village, comes into view. The path crosses over the rail line and a set of steps descends to the station platform. 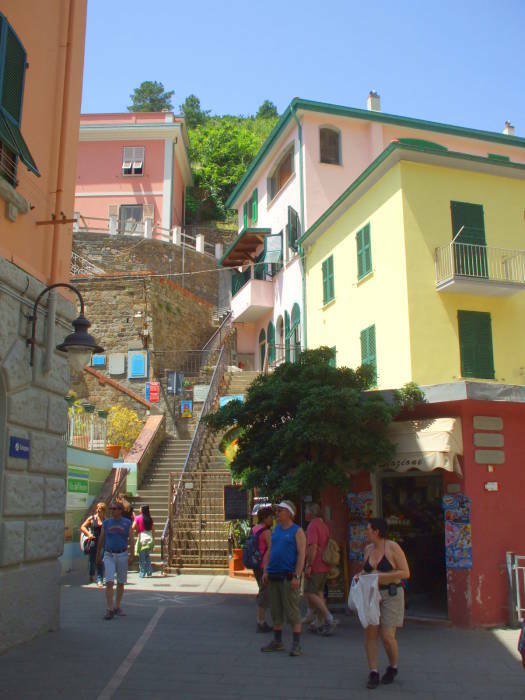 A pedestrian tunnel leads from there into the town. 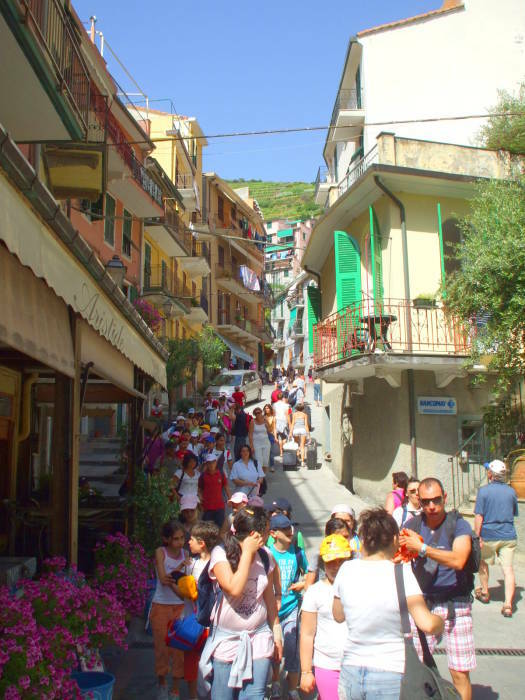 Manarola is the second smallest of the Cinque Terre villages. However, it may be one of the oldest ones. The cornerstone of its Cattedrale di San Lorenzo dates from 1338. 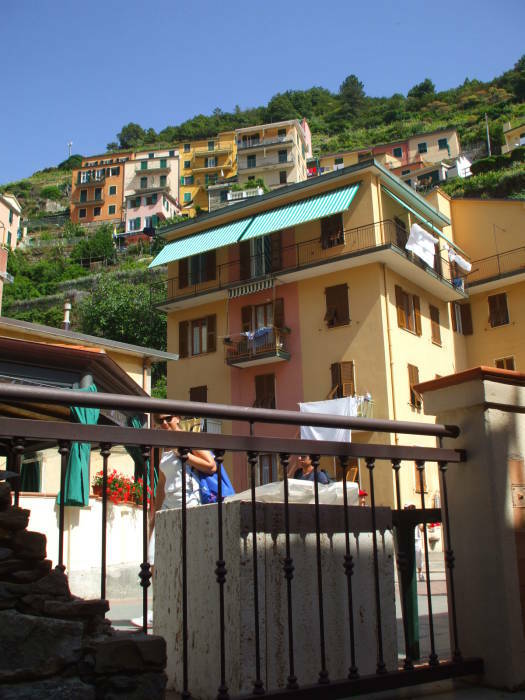 More grapes are grown around Manarola than around any other Cinque Terre village. 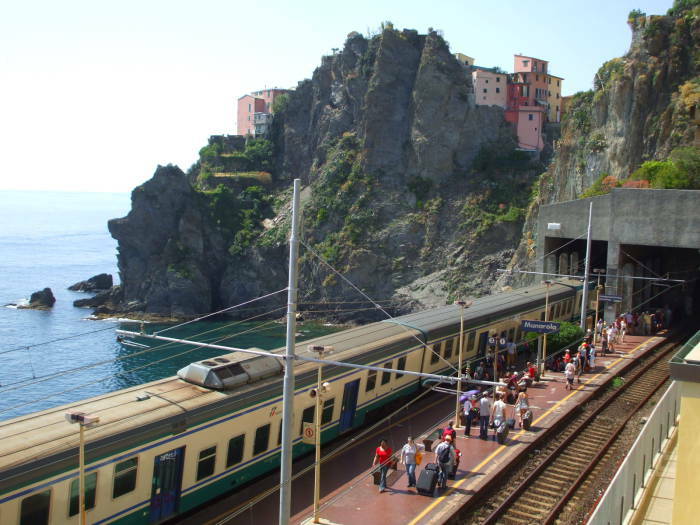 After a walk through Manarola to admire its brightly colored buildings, we return to the station and hop on the next train. 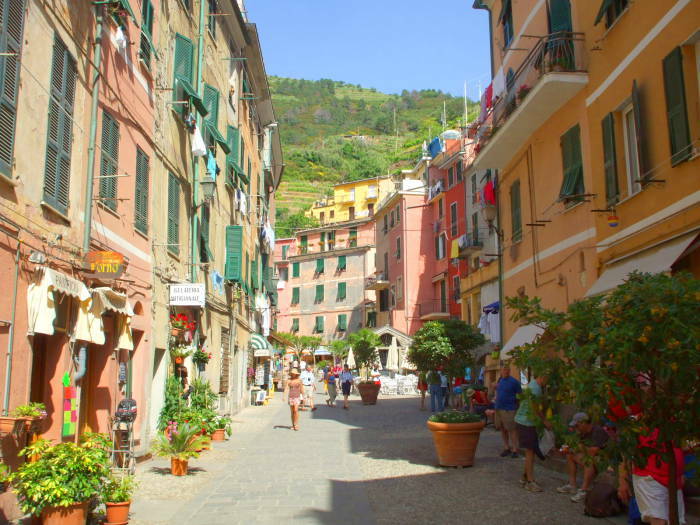 The main street of Vernazza leads from the train station down to the port. 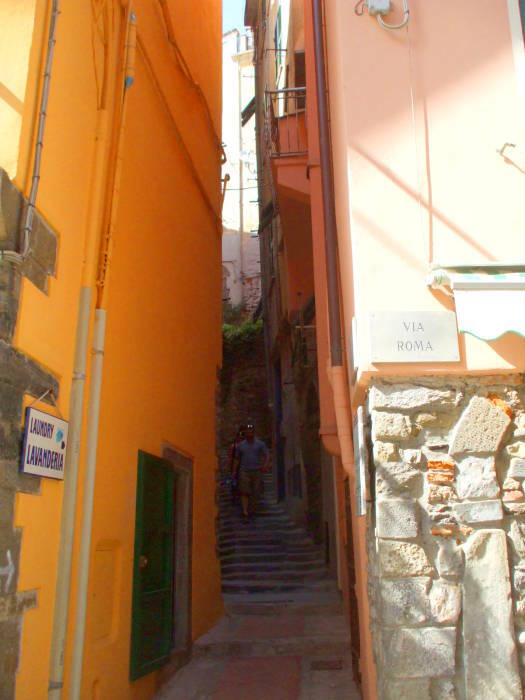 Small side lanes, many of them no more than narrow staircases, lead off to either side. 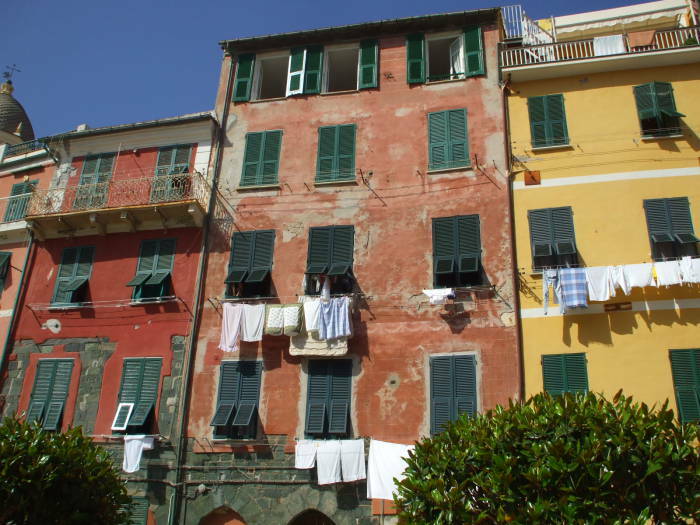 Again, the buildings are painted in a variety of bright colors. 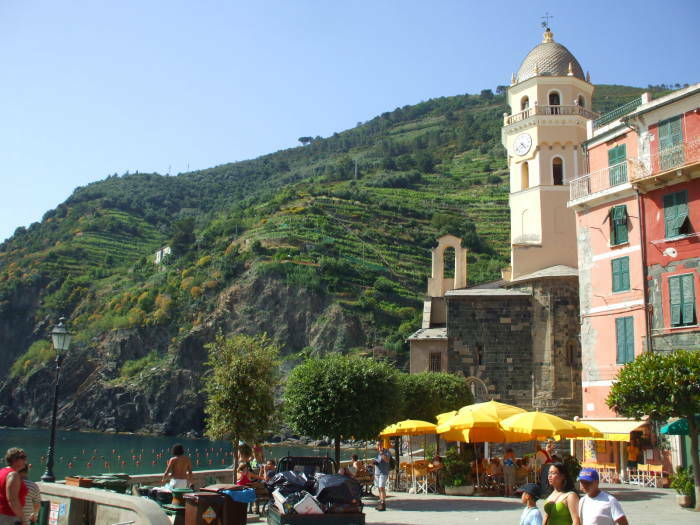 Vernazza's main piazza is large and roughly triangular, opening into the protected harbor. 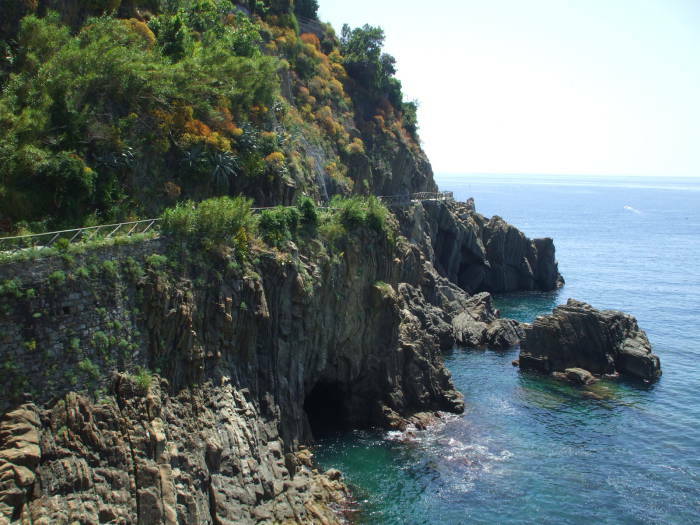 There are ruins of an 11th century fortress, and the relatively newer Doria Castle, built in the 15th century to protect the village from pirates. The church of Santa Margherita d'Antiochia was built starting in 1318.